We were delighted to be featured in this weeks Tallaght edition of The Echo. Dr. Ken Moloney of the Institute of Technology in Tallaght and Niamh Pedreschi were both interviewed and photographed as a result of our participation in the SEAI Sustainable Energy Innovation Award. 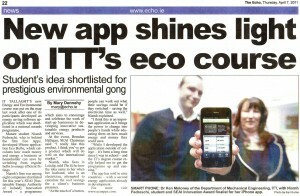 This entry was posted in All Posts and tagged Institute of Technology Tallaght, ITT, The Echo. Bookmark the permalink.